A new flag for Lincolnshire has been unveiled at five separate ceremonies across the county. 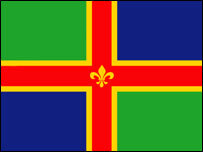 The flag was chosen in a vote by organised by BBC Radio Lincolnshire along with Lincolnshire Life Magazine. The winning entry was selected from a shortlist of six designs and attracted thousands of votes. It features a red cross with a fleur de lis in the centre on a blue and green background. A gold border represents the crops grown in the county. The blue on the flag represents the sea and sky of Lincolnshire and the green symbolises the fields, while the fleur de lys represents the City of Lincoln. Devon picked a green and white cross after a similar contest in the south west.